Throughout history, languages have always been in flux. However the current pace of change is unprecedented as ever more traditional languages are disappearing and few appear to replace them. There are approximately 6000 languages in the world and at present, it is estimated that over 50% of these languages are endangered; 96% of these languages are spoken by only 4% of the world’s population; and on average, one language is disappearing every two weeks. Sindhi is now definitely on the endangered list, especially in India. Sindhi is not only spoken in Sindh (now Pakistan) but it is also spoken by a sizable number of Sindhis in India and abroad. India has granted recognition of Sindhi language under its Constitution. However, while Sindhi is being heavily Urduised in its native Sindh, in India it is losing its value due to dispersed position of Sindhis; lack of opportunities to learn the language in its Arabic script or Devnagiri (Hindi) script; and is influenced by local languages of the States in everyday conversations compounded by hesitancy to speak the language at home among ourselves. These are sure signs of a death knell for Sindhi in India. The other signs of Sindhi endangerment are declining number of speakers; younger generations preferring to speak another language; failure of parents to teach Sindhi to their children and declines even in those domains where the language was once secure (for example in cultural observances in the home). Additionally, geographic isolation is no longer an effective buffer (as in the case of Sindhi in Sindh) given the unprecedented span and impact of global communications compounded by influx of refugees from India. A language is said to “embody the intellectual wealth of the people that speak it.” Given the clear relationship between a language, culture and one’s sense of worth, the decline of Sindhi in India is a serious loss. Losing a language is like dropping a bomb on its culture. UNESCO has committed itself to preserving endangered languages and promoting the linguistic rights of persons belonging to minority groups. Many countries – the United States, New Zealand and Spain among others – are now endeavouring to preserve their minority languages while others such as Wales and Israel have managed to restore languages once thought to be extinct. Their success in doing so indicates the importance of a community support, literacy, media support and opportunities for people to use these languages in their daily life, at home and in the workplace. The wisdom passed down from generation to generation has a central place in many cultures where the extended family has traditionally played a major role in child-rearing. Grandmothers were the primary figures in our lives. Like in the life of President Barack Obama, his grandmother was the reference point, the person he was most eager to make proud. Similarly, speaking in Sindhi should make all of us feel close to our culture and heritage. When language, along with cultural wisdom and pride, are no longer passed down to the next generation, children — and our society as a whole — lose something. The richly diverse cultural and familial traditions of our own communities, and the intergenerational wisdom that is imbedded in them, are all being lost with the decline in the use of Sindhi among Sindhis. Yet these could serve us well in our struggle with some of the complex social issues that face us. When language and culture are preserved, and children take pride in who they are, they learn to respect one another. The mute question that now begs answer is: How do we preserve our language and along with it our culture and heritage? Our first step should be to make our community aware that whoever still knows and speaks Sindhi is a custodian of our ancient language, its culture and its heritage. The teachers, scholars and professors will remain the treasurers of our language and customs but what use will it be if the community and its people do not make use of the treasure held by them. Unless there is a medium and easy access, the treasure held by such scholars will remain unseeded. Our second priority should be to find new medium (script) since Arabic and Devnagiri scripts do not have adequate reach for the entire dispersed community. In this respect, I am glad to state that few enterprising people from among us have taken the first steps to draw out a Romanised Sindhi Script. And I am glad to have had an opportunity to be among them. This will certainly help integrate the Sindhi Hindu community, whose children are more adept with English than any other language. (Refer www.RomazidedSindhi.org) Our third priority should be to speak in Sindhi between us as much as we can. This is very important if we need to preserve ourselves as a distinct community. Language is a peg to hang our culture on. Our fourth priority should be to unite and revive our age old Sindhi customs and traditions. Irrespective of where we are, we have our distinct way of life, cuisine, habits, expressions, sages, deities, dress and even humour. They must be adopted and practiced with pride. We must overcome hesitation to disclose that we are Sindhis. We must remember that we have a long history, distinct culture and sharp acumen. The future of Sindhi is in the hands of the present generation. It’s up to them to endeavour to preserve it or let it get fragmented and be absorbed by other dominant languages. In this respect it must be stated that the efforts of Alliance of Sindhi Associations of America Inc is laudable in making every effort to preserve our language and culture and giving it a wider canvass by holding annual meetings at various locations in different countries. Good luck and best wishes to the organizers of this meet at Jakarta and many more to come. Contact: (91 44) 2624 6140. 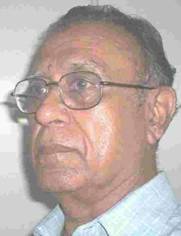 Colonel Ram Gulrajani, was born at Hyderabad (Sind) in 1935, had his primary and secondary schooling in Sindhi at Karachi and the rest of the education till post graduation in Chennai and Mumbai. He is a proud Sindhi who loves Sindhi language. After retiring from Army in 1988, he is settled in Chennai.